Lynne Boyer "2008 Woman of the Year"
Hawaiian surf is generally where top surfers make their lasting impact. And in a sport heavily weighted down by male egos, when a woman proves her worth in the North Shore’s waters people take notice. 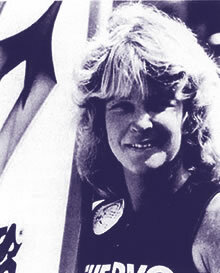 And just like that, Lynne Boyer took women’s surfing in the late ’70s to new heights. Hailing from Haleiwa, Hawaii, Boyer’s rise to greatness came from her reputation in the juicy surf. Her low stance and rail surfing drew instant comparisons to a female Larry Bertlemann – the eye-catching Hawaiian who redefined hotdog surfing in the ’70s. She proved a worthy rival for longtime dominator of women’s surfing Margo Oberg. Beginning in 1977, the two were constantly in the running for the newly established women’s world tour title. Boyer and Oberg traded off world titles, with Boyer winning in 1978 and 1979, while Oberg took 1977 and 1980. “You could say she was a more radical surfer than I was,” Oberg said of her rival. She still resides in Hawaii and has embraced her second love in life – painting. Although she enjoyed sketching and drawing throughout her entire life, Boyer chose surfing over art in her early years. Now her choice medium is oil on canvas, and her realism includes the mesmerizing landscapes and seascapes of Hawaii. 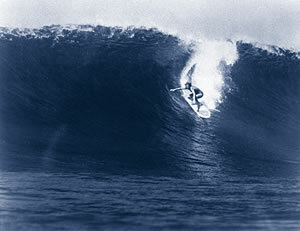 PHOTO: Lynne was known for her aggressive attack on the large wave faces of Sunset and Haleiwa.